*Served at Weston, Doral & Pembroke Gardens from open to 12pm. Crescenza Stracchino, basil, and fig preserves. Gruyere, fresh avocado, red roasted peppers, and rosemary aioli. Brie and raspberry cranberry relish. Artisanal Cream Cheese, fresh avocado, red roasted peppers, and chipotle mayonnaise. Artisanal Cream Cheese on a butter toasted French baguette and your choice of fruit spread or varietal honey; served with fruit. Croissant served with our specially selected jam. Two "steamed scrambled" eggs with grated Parmigiano Reggiano served with Prosciutto and baguette toast; drizzled with extra virgin olive oil. Two "steamed scrambled"eggs topped with Crème Fraiche served with smoked salmon and baguette toast; drizzled with extra virgin olive oil. Two "steamed scrambled" eggs with grated Cheddar Cheese served with Black Forest Ham and baguette toast; drizzled with extra virgin olive oil. Two "steamed scrambled" eggs with Crumbled Feta served with sautéed fresh spinach and baguette toasts; drizzled with extra virgin olive oil. Our delicious baguette with cinnamon honey, powdered sugar, orange zest, and fresh berries, served with your choice of cinnamon honey or maple syrup. Our delicious baguette with Nutella, cinnamon honey, powdered sugar, orange zest, and fresh berries, served with your choice of cinnamon honey or maple syrup. Asiago Fresco, diced Granny Smith apples, golden raisins, pine nuts, fresh basil, mayonnaise & greens!. Gruyere, shredded carrots, EVOO, mayonnaise & greens. Gruyere, Black Forest ham, béchamel. Gruyere, black forest ham, béchamel, and a runny egg on top. Feta, tomatoes, and cucumbers on toast. Steamed Scrambled Eggs w/ English Cheddar and avocado. Featured Specialty Cheese and abundance of meat, roasted vegetables, fresh herbs, and seasonings, served with fruits. Served with Whipped cream and fresh fruits. Gruyere, bacon, and sunny side up egg. Fresh Mozzarella, tomatoes, fresh basil, basil pesto, extra virgin olive oil, and balsamic vinegar. Smoked Cheddar, fruit chutney, mayonnaise, and greens. Asiago Fresca, diced Granny Smith apples, golden raisins, pine nuts, fresh basil, mayonnaise, and greens. Brie, raspberry cranberry relish, and greens. Manchego, black olive tapenade, extra virgin olive oil, balsamic vinegar, and greens. Artisanal Cream Cheese, tomato, red onion, capers, fresh dill, ground black pepper, lemon juice, and greens. Feta, tomatoes, roasted red peppers, red onions, avocado, cucumbers, and EVOO. Aged English Cheddar and sundried tomato pesto. Gruyere, shredded carrots, extra virgin olive oil, mayonnaise, and greens. Goat Gouda, tomatoes, avocado, rosemary aioli, and greens. Jalapeño Monterey Jack, roasted red peppers, basil pesto, mayonnaise, and greens. Chicken Breast, Chicken Salad, Tuna Salad, Hummus, Smoked Salmon, Prosciutto, Serrano can be added. Fresh Mozzarella, tomatoes, fresh basil, and fresh bread. Fresh Goat Cheese, dried cranberries, candied walnuts and fresh bread. Cheddar, tomatoes, avocado, bacon, and fresh bread. Parmigiano-Reggiano, homemade croutons, and fresh bread. Feta, tomatoes, cucumber, red onion, green peppers, red onions, Kalamata olives, dolmas, and fresh bread. Feta, tomatoes, greens and your choice of Tuna Salad/Chicken Salad. Fresh Goat Cheese, cucumber, red onions, capers, dill, and fresh bread. Gruyere, roasted red peppers, cucumbers, tomatoes, lemon, and fresh bread. Cheddar Cheese, Yukon Gold potatoes, onion, chives, tomato and smoked bacon in a rich cheddar cheese sauce. Crème Fraiche, seasoned with onions and finished with a hint of basil. Brie and Swiss Cheese, mushrooms, potatoes, chopped onions, shallots & chives in a vegetarian veloute. Amontillado sherry top off the rich cream base. Any sliced baguette brushed w/olive oil and garlic, lightly toasted and served with three of our homemade spreads -- fresh basil pesto, sundried tomato pesto, and black olive tapenade. A scrumptious assortment of fresh baked cookies and fudge brownies; garnished with caramelized walnuts, dried cranberries, fresh rosemary, and a light dusting of powdered sugar. A delicious cake packed with ground Marcona Almonds; coated with powdered sugar, dried cranberries, and caramelized walnuts. It is presented on a beautiful natural woven willow tray. Choose Dark or Milk Chocolate. Served with brownies, strawberries, apples, cookies, marshmallow & pound cake. Served with potatoes, broccoli, carrots, cauliflower & French baguette. Add on Prosciutto, Serrano Ham, Saucisson Sec. Feta, Muenster and Brie, oh my! 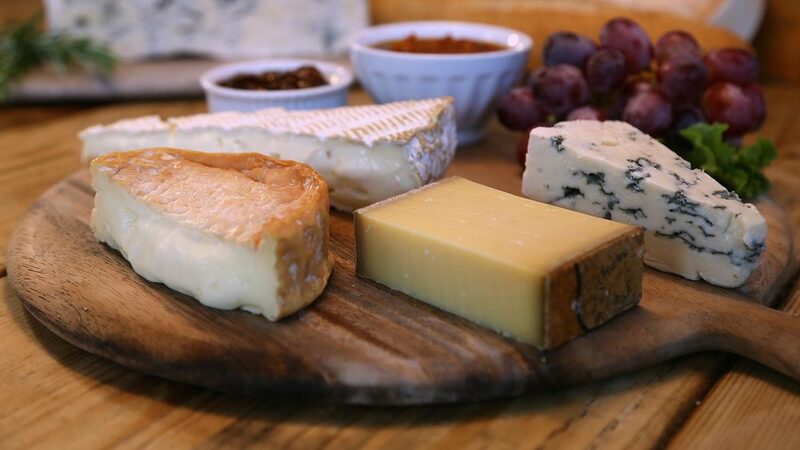 Let us help you navigate through the World of Cheese with our cheese list, where you can search by category, milk type and region. Want more cheese? Contact your nearest location! Thank you for contacting us! We will get back at you as soon as possible. The Cheese Course Franchising, LLC.